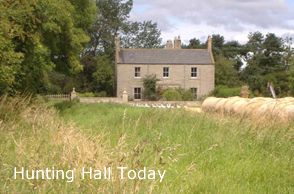 Hunting Hall is a small, traditional family farm of 278 acres, situated between Lowick and Beal. The farm has 230 acres of arable land, a herd of rare breed pigs, and a small flock of organically managed sheep. The business is owned by J D & M Burn, but in 2000 W L Douglas & Son took up a farm business tenancy on the arable land. For the last 10 years William and James Douglas, and J D & M Burn have worked together in a very successful partnership; farming with sensitivity towards the environment and enhancing the countryside for wildlife. As part of Natural England’s Higher Level Stewardship scheme, we have put together an exciting conservation programme for the future which will build upon past achievements and improve the existing landscape. This small woodland and pond area was created by Tom and Karen Burn in 1992. As youth leaders with the Wildlife Trust Karen and Tom led Belford Wildlife Watch Group in a project to enhance the area for wildlife, adding more plant species, bird and bat boxes, clearing the pond and building a footbridge. Today the area is approached by a disabled access path and has a bird hide and dipping platform. Tom and Karen’s eldest daughter, Meg Burn, was delighted to win Young Environment Champion of The Year 2001 and with her award she designed and helped to create Meg’s Wood and Pond. She worked with young children to include wildlife-attracting plants in her wood. There are many areas on the farm set aside for wildlife. 4 metre grass margins run around all our arable fields, offering habitats for many small mammals and birds. The introduction of these grassy strips made an immediate impact on the farmland wildlife, increasing the number of hare, partridge and voles. Not long afterwards the first barn owls in 50 years nested on the farm. 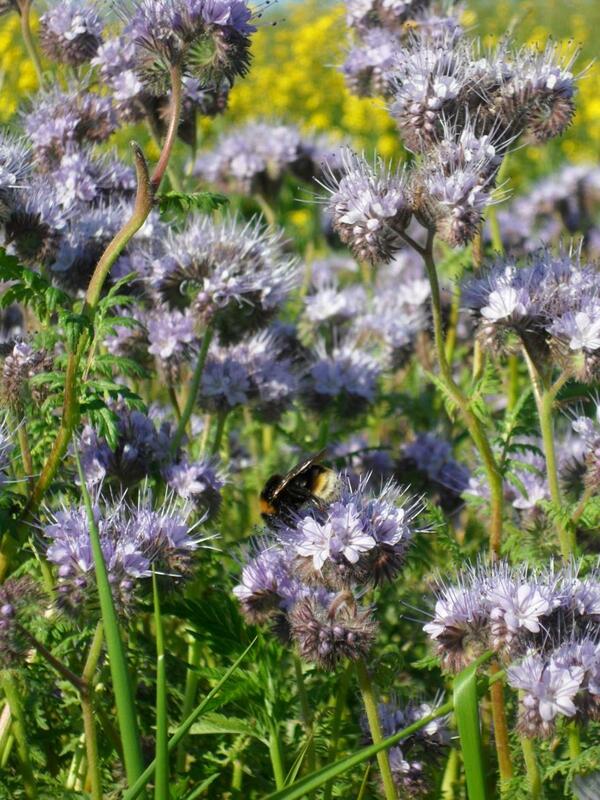 Areas of field sown with a pollen and nectar mix become a blue haze of borage and phacelia in the summer, humming with insects. Wild bird seed mixes offer cover and food for farmland birds; those sown with sunflower seeds are particularly beautiful! Hunting Hall is a lowland farm about 70m above sea level, just inland from the Area of Outstanding Natural Beauty Coastal strip near Holy Island. The soil is a medium loam with strips of clay running through. The land is good for growing crops and sheep grazing, but not ideally suited to outdoor pigs, as it is too heavy. The South Low runs through two grass meadows on the farm. This short stream starts a few miles upstream at the Nagup Dene and Stanky Burn and carries on through several farms before reaching the sea at the bridge on Holy Island causeway. There has been a farm at Hunting Hall for many hundreds of years; in fact, the outline of circular ditches on the far bank of the stream suggests people chose to settle here prehistory. There is plenty of evidence to show that Hunting Hall was once a thriving community. The 1841 census describes 22 people living and working on the farm – today there are just 3! In the 1950s, the old farm workers’ cottages were converted into a piggery, which we’ve just converted into the farm classroom, whilst the remains of the smithy, stables, granary and watermill are falling into disrepair. Our hen house was probably built when the Napoleonic wars created a demand for eggs to be shipped from Berwick to London. The farm lies on the route between the old Roman road north and Holy Island, and many pilgrims would pass Hunting Hall on their way to the island. In 1951 Fred Burn bought Hunting Hall Farm and now, two generations later, we are aware of the historical and natural heritage in our care. We hope that young visitors to Hunting Hall will discover the fun of exploring the countryside and find ways we can all work together to look after our environment.